John Cena’s 2017 Ford GT. Late last year, pro wrestler and actor John Cena went from one of the few handpicked by Ford to buy its limited-run Ford GT to party in a lawsuit over it. But just over a week before Ford sued Cena for selling his car against a customer agreement, the automaker also went after the dealer that bought the car in a rushed attempt to prevent a resale. Apparently, that attempt failed, and the car was gone before Ford could stop it. In case you need a recap: the Ford GT is a 647-horsepower, Le Mans-style supercar that Ford revived in the 2017 model year with a 3.5-liter EcoBoost V6 engine and seven-speed dual-clutch transmission. It’s radically different than the last GT generation, which had a supercharged 5.4-liter V8 that made 550 HP and a manual transmission. Ford chose only a few hundred people, or about 7 percent of the 7,000 applicants, to have the chance to buy the $450,000-plus car, and court documents show that Cena’s cost $460,000 with options. People who have owned the new Ford GT, including Cena, who sold his 2017 model soon after buying it against Ford’s customer agreement requiring an owner to keep the car for two years, seem to love it. We even said it makes other supercars look soft. But, because Americans like their V8s and more horsepower is always better, the GT simply hasn’t had the same dazzling time in the spotlight as, say, the Dodge Challenger SRT Demon that’s rated at 840 HP from a mean, supercharged Hemi V8. The GT has seemed to make more news in terms of its strict customer rules and applications, nightmare servicing requirements and resale drama than in its actual, well, being. Cena got handpicked for a court date thanks to a customer agreement he signed with Ford, which said he agreed to keep the car under his ownership for at least 24 months after receiving it. That was part of the generic owner agreement to buy a GT, since Ford worried about rampant, profit-turning resales hurting the car’s value—and Ford’s brand. Last week, a 2017 Ford GT showed up on the Mecum Auctions website as a for the company’s Indianapolis auction. A Ford spokesperson told Jalopnik the company doesn’t comment on customer matters or on ongoing litigation like the Cena court case, but said “all Ford GT customers sign contracts, which include an agreement not to sell the car for at least two years.” The GT at Mecum sold for almost $1.7 million, with a Mecum representative saying at the start of the auction that a judged ruled in Mecum’s favor about selling the car. This dealer lawsuit is yet another exhibit of the stipulations around owning the Ford GT being almost more newsworthy than the car itself. Ford sued Cena on Nov. 30 and Chico, California dealer New Autos Inc. on Nov. 22 of last year. That first lawsuit has been widely covered—the second one, not so much. Aside from a couple of local stories about a GT in a dealer showroom, news outlets, including ours, missed the other lawsuit involving the car. Neither case has been closed yet, with Cena and Ford’s non-jury trial estimated between April and June of 2019. The jury trial between Ford and New Autos Inc. isn’t scheduled to happen for more than a year, either, with the date set for 9 a.m. on June 18, 2019. It’s expected that each trial will last about five days. But the dealership that wound up with the car—and, as it claims, sold it soon afterward—didn’t sign anything, and Ford’s reasons for going after it in court are a little less straightforward. Here’s what’s going on. Ford filed a federal complaint against New Autos Inc. that day in November, the Eastern District of California’s U.S. District Court, partly on the assumption that the dealer knew about Ford’s resale agreement with customers. New Autos Inc. denied that claim in its response. 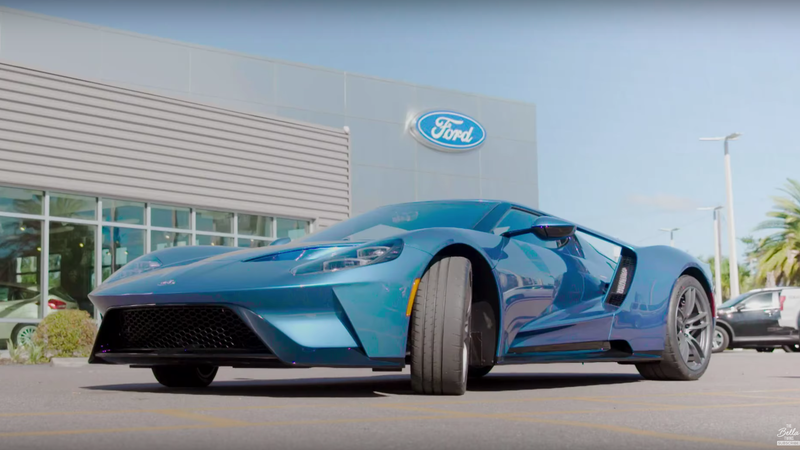 Jalopnik reached out to both New Autos Inc. and Ford about the lawsuit, and Ford said it cannot comment on ongoing litigation. We did not hear back from New Autos Inc. before publishing, but will update this story if we do. The lawsuit against New Autos Inc. didn’t say whether Cena’s GT came into its possession straight from Cena or by another sale, only that Ford learned the car was in the dealer’s showroom around the evening of Nov. 21—a day before the lawsuit against the dealer was filed. There was likely such a quick turnaround because, as Ford claimed in its lawsuit, the car was about to be out of there. Ford cited its strict customer agreement in the lawsuit against New Autos Inc., a company that brokers and delivers vehicle purchases upon customers asking the dealer to find a certain car, which requires the people chosen for a GT to own it for 24 months. Court documents show that Cena signed the agreement. After Ford found out that the car with a VIN matching Cena’s was in the New Autos Inc. showroom, Ford claimed that a company representative visited the showroom, took photos of the car. Ford also claimed its representative was told by a New Autos Inc. representative that the car would be moved that night or the next day—the next day being Nov. 22, when the complaint was filed. Ford said in the complaint it believes New Autos Inc. specializes in exporting overseas, and that it thought that might happen to the GT. New Autos Inc., in its response, said the car was in the showroom but denied a representative saying it would be moved or that it could potentially be exported overseas. In the news story, Burnie [sic] Knaus, owner of New Autos, acknowledges that when he received a request for a Ford GT supercar he was first excited but then states: “My second thought was, the how the heck and I going to get them, almost nobody can get these cars...There’s less than 90 of the Ford GT....” The news story also notes that more than 6,000 people applied to get the Ford GT and even sent in videos explaining why they deserved it. The “purchasers” part still isn’t clear, since no documents say to whom the GT was allegedly sold. The dealership claimed that the car was sold before Ford officially stepped in to try to stop the sale, which was on Nov. 22 of last year. Several court documents listed the VIN number of Cena’s car, which, when run on CarFax, show the car to have been registered twice—once in Montana, and once in California. The report showed the car to be a one-owner vehicle despite more than one title registration, with 280 miles on the odometer at the last reading and no damage or accidents reported. The car was most recently registered in Chico, California in February of this year, where the dealer is located, but it was registered there four months after Ford filed the complaint trying to stop a potential sale—to a customer in the U.S. or overseas. The dealer said it sold the car before the original complaint, meaning it’s not likely that the dealer registered it on Feb. 20 of this year. CarFax is only as good as the databases it pulls from, though, so this may not tell every detail. If someone new does have the car, ownership must come with a huge burden—especially if there’s a search for others involved with any purchase of Cena’s car in relation to the court case. There aren’t many GTs around, and even fewer of them are gunmetal blue with no racing stripes. That likely forces some level of hush-hush about a car that’s hard to stay quiet about, to avoid potential action from Ford. But even if that silence is broken and more action is taken, it’ll just be another strike in the column of Ford’s strict rules, legal actions and over-exclusivity in regards to its most expensive street-legal product ever taking the spotlight over the actual car. And at some point, the Ford GT is going to feel like it struck out. If you have any clues about who might own the car now, if it’s yours, or if you have any other information, here’s how to privately and securely contact Jalopnik.